Mango Spiced Smoothie is one of the new favorites in this house. The bright yellow color is so inviting and reminiscent of sunshine, isn't it?! 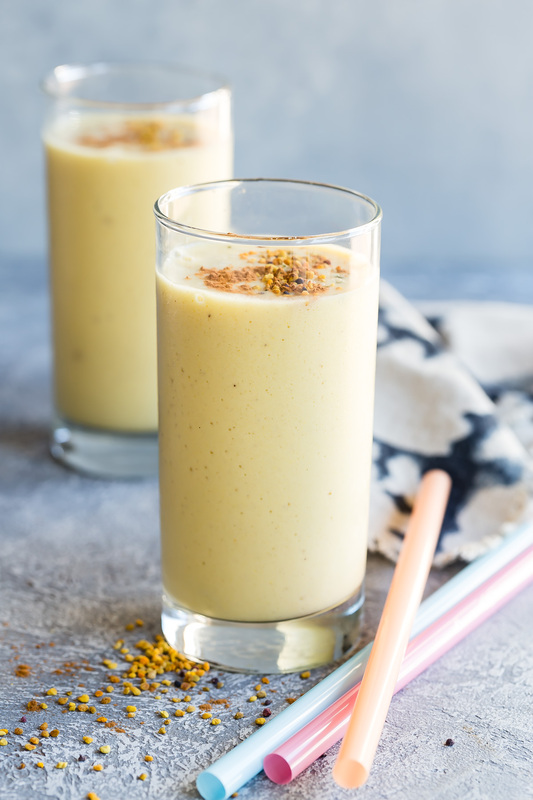 Mango pairs incredibly well with spices so I added turmeric (our favorite inflammation fighter) and cinnamon to give that sweet and spicy flavor boost. 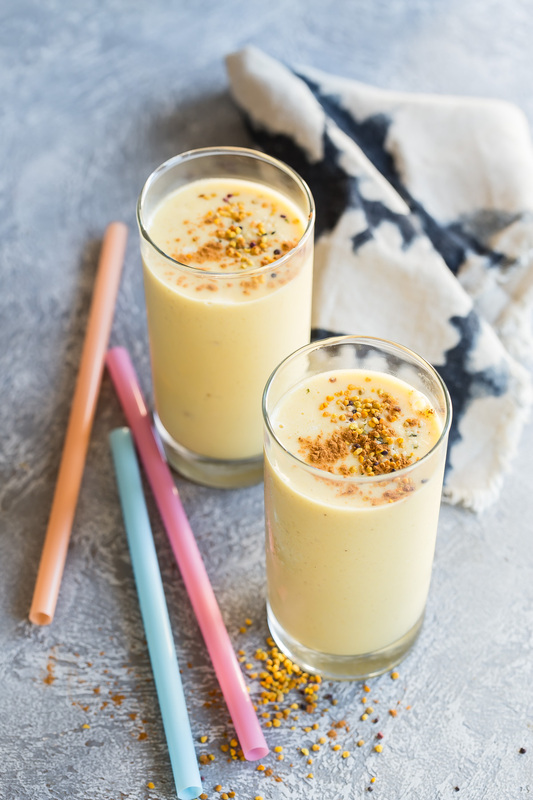 One of the things that I really love about our morning smoothies is that we can each have our own favorite flavors and we can switch them up any time we want. Coming up with tasty new flavor combos has become a bit of an obsession of mine, and I'll be sharing some new smoothie with you in the coming weeks, so stay tuned! 1. Place all the ingredients into a blender in the order listen. I never would have thought of CAULIFLOWER is a smoothie! Now I really want to try this (as if mangos weren't enough, mango smoothies are an addiction), and see if my 5yo would like it too. Is the cauliflower raw? or cooked before frozen? I know bee pollen is supposed to be great for you, but I haven’t added it to my arsenal yet. Do I need to sub in something else for it, or just leave it out? Thanks! Hi! Do you steam your cauliflower first and then freeze it? Thanks so much! I really don’t know best way to say this because of some of us who don’t believe in spirituality. I used to be like that anyways..but not until my husband started leaving me for someone else, my eyes got opened. And now I can tell you that, yes.. spiritual things are so very real. the problem is that, you should get to meet a real spiritualist who will help you with a real result. And today, I introduce you to goddess JAI MATA SUNLIGHT.’’ Priestess of Ezioguru Temple. I contacted her Via [email protected] that my husband is leaving for someone else at his working place. And he told me that we can’t work together anymore that he’s found the love of his life. And I know the lady,. I could fight her physically, but that would create more problems than helping me get back my man. So I contacted jai mata sunlight on the above E-mail and told her the story. She replied and ask few questions I answer correctly. Then she told me what to do of which I don’t know anything about rituals or spiritual So I payed for the rituals to be performed. then she asked of his name and photograph. The truth is, while this was going I was having this doubt in my mind whether It will real work? Because I haven’t done anything spell before. Beloved and behold after the rituals, 12hrs later, I don’t know exactly what happens between them. my understanding of the spell of JAI MATA SUNLIGHT, she cause problems just to separate them. Yesterday, he came painfully with his head patched that the lady broke his head with a bottle just because he argued with her of cheating on him with another man with the pictures and calls he saw on her phone. The whole thing happens so fast that I can’t explain. And After he begged and I forgive him, he swear never to leave me again. I am still very surprise and thankful to JAI MATA SUNLIGHT’’ and I’m happy though that I have him back. Pls readers don’t just read. reply this comment if you have also gone through a process like this,.. and share your experience. And if you need spiritual help, pls via the above E-mail to get yours and share I want to read also from you to confirm my testimonies thanks and stay bless.